Who doesn't love to visit strange and exotic destinations? Some would say that the entire point of tourism is to experience a radically different environment for a little while. In that regard, East Asian vacations can be some of the most interesting and engaging. The far east has always been known for being exceptionally unique in its cultural and societal practices. Their art and architecture are also unique, and very different from the traditional art forms of the west. All of this combines with the natural friendliness that (most of) the inhabitants have, to create the feeling of being immersed in an alien world. Chiang Mai isn't quite as well-known as its larger brother Bangkok, but it nevertheless warrants a spot in the itinerary of any well-planned trip to Thailand. As the country's fourth-largest city, Chiang Mai has plenty of things to do and plenty of interesting people and events to offer. 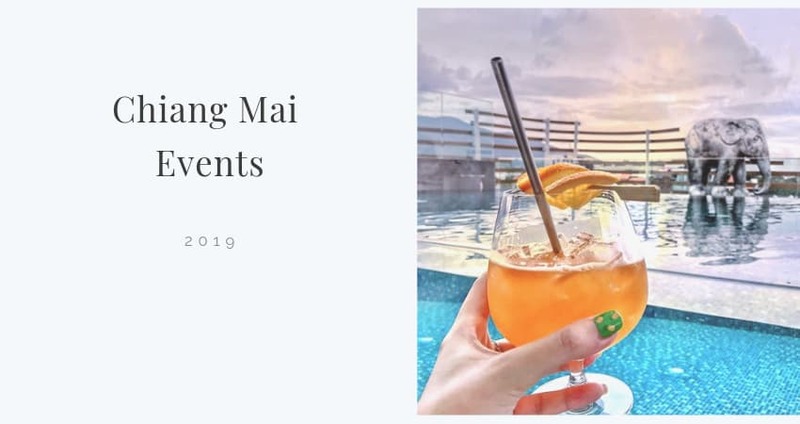 With that in mind, let's take a look at some upcoming Chiang Mai events that you and yours might enjoy. As you will see, this city has a huge variety of fun and fascinating events for 2019. The Songkran festival, commonly known as the Thai new year, is a fun and rambunctious occasion that is famous the world over. Songkran is famous for holding the world's biggest water fight, where anyone can take a squirt gun or a bucket and proceed to drench everyone in sight. I'm not sure if water balloons are allowed, so it might be best to avoid them. This is one occasion when you can walk up to a total stranger and blast them in the face with a water gun without a care. Don't worry, no one will get mad, as everyone is considered fair game. Only certain people, link monks, nuns, and the elderly are considered off-limits. As water fights go, this is the king of them all. Before you even step out into the street on these three days, be aware that this holiday is celebrated throughout Thailand and that no exception is made for foreigners like you. As such, make sure your phone, camera, and any other water-sensitive items are stored in a waterproof bag. Make sure the bag is kept well-sealed at all times because you never know when someone might come out of nowhere with a squirt gun. Like any good festival, there are also festive parades and amazing street foods. One of the most popular Songkram food is called Khao Kai Jeow and consists of a fried egg omelet with rice and pork. While it may not be the healthiest food in the world, it's good enough that you won't care. There is also a certain religious significance to this event, so those who are interested in local religious customs will also find some things to enjoy. All over Asia, festivals involving mass amounts of candles or lanterns are common. However, this might be one of the most striking, due to their use of floating lanterns in huge numbers. Loy Krathong, festival of lights is not a tourist-trap event but a solemn religious observance in which foreigners are allowed to take part. Everyone gathers in a large field with candles, lanterns, and other natural lights. The star of the show is the floating lantern, which is basically a miniature hot-air balloon. After being lit, the lantern will eventually leave your hands and rise into the air. The visual effect created by thousands of these going into the night sky at one time is incredible, and cannot be fully experienced from a picture or even a video. The locals always make a wish when releasing their lantern, but it is believed that your wish will only come true if you do good deeds during the coming year. If you're curious about the science behind the floating lantern, allow me to spoil the magic for you (skip this part if you don't want to know!). It is a simple fact of nature that hot air rises and cool air descends. Thus, if you trap some hot air, it will have a natural tendency to rise, since it is lighter than the air around it. The paper lanterns that are used in the Loy Krathong work by capturing hot air. Because the lantern is made of paper and thin wood, it is very light and thus able to fly a very long way. If you like flowers, this is one event you won't want to miss. The Chiang Mai flower festival features a procession of elaborately decorated floats, each made from various flowers. Flowers of every imaginable shape, size, and variety will be on display. If you want to purchase some nice ornamental plants, this is a fine place to get them. Just be careful, because you may have trouble bringing them back into your country! It is hard to say what you will see at this festival, because it is a celebration that revolves around creativity, and thus it will tend to be a little different every year. Of course, don't forget about all that good street food. A huge variety of street foods is one of the main draws of this particular festival. Traditional dance and costumes are also widely on display, combining with the other factors for a cultural experience that is unique and authentic. There is also a pageant in which girls from all over compete for the title of "Flower Festival Queen." If your idea of a great day is good food and beautiful sights, you couldn't ask for anything better than this. Gallery Seescape is a beautiful art gallery located in the trendiest and cleanest part of town. Nimmanhemin road is generally regarded as the newest and most expensive part of Chiang Mai. So, it's not surprising that you would see a high-quality art gallery. This gallery focuses mainly on photographic and video art, giving it a touch of modern elegance that is hard to beat. There is a small cafe attached to the gallery, which is always lively and buzzing with interesting people. Area artists tend to gather here, so this place is a must if you want to meet any of the local talent. At present, Seescape is planning to celebrate their tenth anniversary with a special series of exhibits. As such, they are planning a special event on December 13, making this the best date if you are planning to visit the area anytime soon. Not everyone enjoys these sorts of places, but anyone who does will surely enjoy the artistic atmosphere and the local flavor, as Chiang Mai is a city of Art. Perhaps the most attractive feature of this gallery is their outdoor art collection, which is displayed in a lush outdoor garden. If you're already in town for the event at the Seescape Gallery, you might want to know about another event taking place the day before. It is an event being presented by the University of Payap, which will feature Hmong tribespeople putting on a display of their traditional music. The Hmong are an ethnic group that lives in various parts of Southeast Asia. Originating in the area that is now Northern China, the Hmong migrated south as a result of several wars, and have lived in Southeast Asia ever since. While many of the Hmong have embraced either Christianity or Buddhism, there are also many of them that have retained the shamanistic religion of their ancestors, and it is those shamanic customes which will be on display at the planned Payap University event. The event is called "Hmong Songs of Memory: Traditional Secular and Sacred Hmong Music." Music and song are an important part of Hmong religious practice, and if you are in the area you should not miss this rare chance to hear ancient songs that those outside the Hmong people rarely hear. It is also a fascinating chance to learn more about a little-known people. Fun fact: The Hmong mostly fought on the American side during the Vietnam War. Wan Awk Phansa is another important religious festival, but this one comes with an interesting twist. This festival marks the end of a period of fasting that is usually referred to as Buddhist Lent. Although the strictest of fasts are only observed by the priests, monks, and nuns, lay people observe it by giving up certain things like meat or alcohol. Needless to say, people are usually ready to celebrate at the end of this fasting period. However, Wan Awk Phansa isn't some kind of riotous party. It is a solemn religious event that is connected to the veneration of divine beings called Nagas. The Nagas are usually depicted as serpent people, and their name is taken from the old Sanskrit word for "snake." On this day, offerings are given to the nagas in the form of various goods placed in small ceremonial boats. A candlelit procession normally ensues, with the brightly lit boats being taken to the river. That's when the interesting part happens. There is a phenomenon that often occurs around the Mekong River at this time of year. Small balls of flame, referred to as "Naga Fireballs," are seen shooting upward from out of the River. While some have brushed it off as a man-made trick, many locals swear that it is indeed a paranormal event. It is worth noting that the "Naga Fireballs" have been seen along a wide stretch of the river in both Thailand and Laos for a very long time. As you might imagine, people come from far and wide in the hope of seeing the "Naga Fireballs." Is it real? The only way to know for sure is to check it out for yourself. Where: The festival is celebrated all around Thailand, but the Naga fireballs are seen only along the Mekong River. If you aren't as interested in solemn traditions and local customs, you can always opt for the Chiang Mai Red Cross Winter Fair. This is just a good old-fashioned carnival, much like you might see anywhere in the rest. They have things like ferris wheels, bumper cars, and various games of skill. They have a shooting gallery, a movie theater, lots of activities for small children, auctions for all kinds of goods, bingo, raffles, and even a small roller coaster. There are also normally live musical performances and cultural presentations showcasing both Thai and Hmong culture. Nothing traditional about this one, but it sure is a lot of fun. As the name implies, this fair is sponsored by the Thai branch of the Red Cross. As part of the day's events, they put on a Red Cross parade which is intended to celebrate the work that they do in helping the needy around the world. Considering that they're the ones paying for the whole event, that doesn't seem out of the ordinary. However, it is good to support organizations that do good work, especially when it means having a little fun at the same time. You should be aware that this is a charity event, so you should donate a little something if you plan to attend. This is a local artisan's fair that is held every year in a small village just outside the city. While this event is not within the city proper, it is close enough to reach with a short drive. Woodcarvers and other artisans come from miles around to display and sell their finest works at this festival, and this is why it has come to be well-known in some circles, even outside of Thailand. The quality of the work that has come out of this little village is nothing short of incredible. The statues and furniture that they sell is all hand-crafted and is usually traditional in its forms. This festival is known as one of the biggest and best handicraft markets in the world. One of the great things about this festival is the fact that most (if not all) of the vendors are willing to pay the shipping costs if you want the item shipped back to your home country. They do this because they know that most tourists don't want to haul a large statue or a piece of furniture around all day. Although the woodcarvers in the area will often use modern tools, the art style and forms are based on age-old methods. Perhaps the most amazing pieces are the 3-D pictures made from many layers of wood. You really have to see some of this work to believe that someone did it by hand. This is a historical festival that has a deep and important meaning to the people of Northern Thailand. Before this area was a part of Thailand, it was an independent kingdom known as The Kingdom of Lan Na. Chiang Mai is located almost in the center of their former territory, so the history of the Lan Na kingdom is very important to the locals. The festival of Wai Sa Phaya Mengrai is meant to honor the memory of Phokhun Mengrai Maharat. However, this festival is not based in Chiang Mai, but in neighboring Chiang Rai. It might take an hour or two to get there, but it is well worth it. The entire festival is meant to be one big showcase of the different local communities and the ways in which they are unique. Representatives from all the different provinces will erect pavilions consisting of many grass huts adorned with lights. The whole thing makes you imagine an island paradise at Christmas time. There will usually be a shrine where one can pay respect to the memory of the king who founded the Lan Na kingdom in the thirteenth century. According to tradition, the city of Chiang Rai was founded by King Mengrai and named after him as well. The kingdom of Lan Na prospered for many years before being annexed by the Burmese (then known as the Taungoo Empire). When the Burmese began to crack down too heavily upon them, the people of Lan Na joined with the Kingdom of Siam (which would later become Thailand) in 1776, fighting and winning a war of independence at the same time that the United States was doing the same. The last item on our list is a distinctly religious event, but you don't have to be a Buddhist to take part or to enjoy the proceedings. Visakha Bucha day is meant to mark the three key events in the life of Siddhartha Gautama, commonly known as Buddha. These three key events are his birth, his death, and his enlightenment. Buddhists believe that he was enlightened at the age of 35 and that he died at the age of 80. The events of this celebration involve a festive parade with floats, followed by a long procession (about 11 kilometers) up the mountain to Doi Suthep temple, where the formal ceremonies are conducted. Although this is a happy and joyous occasion, it is not a party destination. In fact, this holiday is such serious business that most local shops will close on that day, and those that remain open will normally refuse to sell alcohol on the day of the ceremony. Although this definitely won't turn into a raucous party, Thailand has a great nightlife anyway. This is an event that will help you center yourself spiritually and experience a different kind of spirituality. Considering the fact that it is not a really well-known tourist spot, Chiang Mai offers a huge variety of different activities to satisfy your cravings for both fun and culture. It is no coincidence that this list includes a mixture of serious cultural events and events that are mostly or entirely for fun. This is done because a good vacation should include a little bit of both. You should never miss an opportunity to learn a little more about this fascinating world that we live in, but you shouldn't forget the primary purpose of any vacation, which is to enjoy yourself. From one end of the spectrum to the other, this city has it all. There is no doubt that the city of Chiang Mai offers many reasons to include it on your schedule when planning the perfect Southeast Asian getaway. Welcome to the Five Star akyra Manor Chiang Mai Hotel, an intimate and exclusive all-suite luxury hotel, each suite created around a courtyard-within-a-room concept. It's the hip downtown hotel Chiang Mai never had. Check in to pure urban style and big city sophistication in the heart of this charming northern city's most buzz-worthy Nimmanhaemin Soi 9, known locally as 'coffee street'. Take in the chic boutiques, galleries, bars and coffee shops, then return to your sanctuary and warm northern Thailand hospitality and the showstopping experiences of Rise rooftop bar and Chiang Mai's best new restaurant, italics.